The BodyGuardz Pure glass screen protector is manufactured from a chemically-tempered glass which not only maintains perfect image clarity, but also provides 8H+ surface hardness. Surpassing steel with this rating, the screen protector offers superior durability, and scratch prevention for your iPhone 5S / 5's screen. This screen protector features a special smudge-free coating that resists oil contamination and fingerprints, making it easier to clean without the build up of grease that can lead to a rainbow sheen effect. Despite being the ultimate in screen protection for your iPhone 5S / 5, this premium glass screen protector is only 0.4mm thick. This means it only adds an almost imperceptible amount of extra thickness to your phone, so you can be sure it is safe from harm while looking as good as new. Because this is a premium glass screen protector and not a film based solution, it does not bubble at all on application. In addition, a special adhesive makes removal, adjustments and re-application easy work. 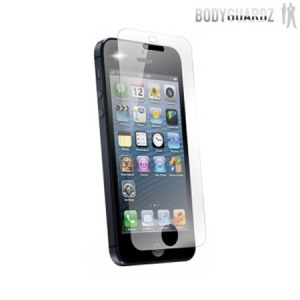 Designed specifically for the BodyGuardz Pure Premium Glass Screen Protector offers a perfect fit for your device. It features cut-outs for the camera, sensors, speaker and button, with transparent sections for the capacitive buttons, so you can still see when they are lit.